Mother and grandmother of champions. Que Sera is acting as seller's agent for Echo Mountain's Jacqueline. We were so disappointed to learn that our beautiful Jeanie is unable to conceive. This girl has fabulous fiber - fine, well organized, consistent and super dense. If you are looking for a white fiber producer - this is your girl. 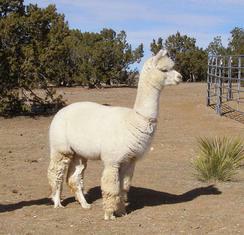 Que Sera Alpacas is acting as seller's agent in the sale of Jeanie's Dream. We accept all major credit cards.